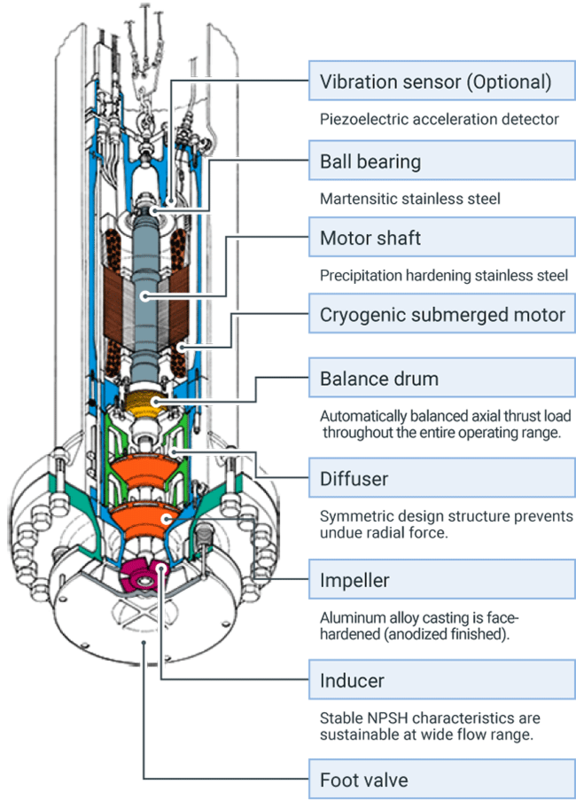 Cryogenic Submerged Motor Pumps | Pumps and Systems | Products and Services | NIKKISO CO., LTD. The unit is a submerged motor cryogenic pump that transports liquefied gases such as LNG and LPG. The automatic axial thrust balance mechanism creates less load on the ball bearing for a prolonged service life. High pump efficiency due to reduced internal leakage. Easy maintenance and reliable pump performance with LNG or LPG tested equipment. LNG is a clean and important energy source in terms of environmental issues. This pump is used in a wide range of fields, mostly centering on energy industries. LNG feed and booster pump for LNG vessel. LNG feed and booster pump for LNG tank. Selected as the world's first LNG feed and booster pump used for LNG floating units (LNGRV's, FSRU's, FPSO's) which performed with excellent results. The pump was thoroughly tested with system, under a reliance test with simulated vessel motion before the first unit was delivered. The unit is a submerged motor pump for low-temperature liquefied gases such as LNG and LPG. Since LNG is a clean and important energy source in terms of environmental issues, this pump is used in a wide range of fields centering on energy industries. Since the pump and motor are combined as one entirely submerged unit, no liquefied gas leaks from the pump. Having a simple and lightweight structure, this unit can be maintained easily. Because the bearing load is minimized in terms of design, the bearing has a long service life. The system has test equipment capable of operating the pump with LNG (-162°C). The pump operates with VFD (Variable Frequency Drive) and allows for soft start and speed control according to downstream load. In 2015, we acquired JC Carter and can therefore provide high quality service for all JC Cater pumps as well as our own cryogenic pumps. 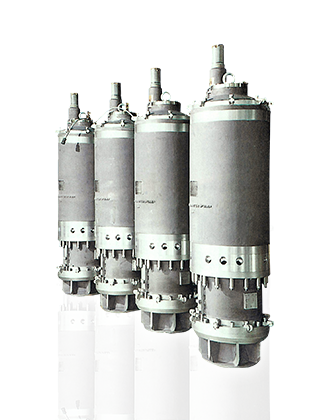 Cryogenic Submerged Motor Pumps are introduced on the website of Nikkiso Cryo, Inc.